PSXFinal DOOM in pk3 format plus an edited GZDoom with new features unique to these projects. 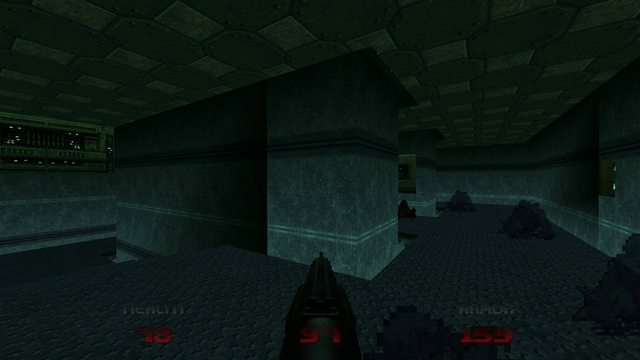 Fixed firing error in shotgun and super shotgun, PSX and Doom64. New flag added in order to the player can auto-telefrag himself. Menu pictures can be stretched to 348 and pics are added to the edges "black bars" to compesate 16:9 screen resolutions. Fixed the double ammo bug given by the Zombie Marines when they die (Zombie Man, Shotgun Guy and Heavy Weapon Dude). You just need to run the Bat.files to start a game. the games are previously configurated. Source Code: the next objective about this project is to aim these features in newer official GZDoom Versions, feel free to make use of all the codes included here! In a couple of days, i will be uploading the source code on Github and will also make a documentation about all of these new features about this source port. Thanks for being waiting this project, those who are interested in this project. Last edited by Erick194 on Mon Dec 17, 2018 1:53 am, edited 1 time in total. P.S. Glad to see this finally get released! This, the release of DUSK and Doom's 25th birthday all on the same day couldn't be better. Last edited by DabbingSquidward on Mon Dec 10, 2018 11:29 am, edited 2 times in total. Hmmm, we didn't know this was happening, to be honest I didn't notice it. Thanks for reporting this, DabbingSquidward. In any case, my brother can be fixing and updating this later. Please, if you find something else, don't hesitate to tell us! Have fun! Got a question: does any of the maps require a compatability mode, or can I just set it to default without worries? Do note that A_SpawnItem is deprecated and was superseded by A_SpawnItemEX. If you don't use the latter in the Sergeant's X-/Death state, GZDoom will crash on pickup. OH MY GOD! Thanks for finally releasing this! I will edit this post with whatever bug i find. Spent a huge chunk of my day off just playing PSX Doom. -Picking up the blue armor in Hectic doesn't kill the player, instead he will be stuck in that chasecam perspective able to move and shoot around that small alcove eternally. -MAP 02: In the blue key room where you need to solve a puzzle, I found the texture for the green triangle switches to be messed up. But could also be my graphical settings, will upload a screenshot later. Pretty sick work here guys. Damned, this must be my brother forgot something there in Hectic, it worked in our early versions. Jimmy Gnosis wrote: Pretty sick work here guys. Playing this reverse engineered source ports and it's versions of PSXDoom and DOOM64 is certainty an experience. I played a few minutes of both your versions of PSXDoom and Doom64 and it's like an utterly alien experience. I honestly think this is what an alternate universe version of GZDoom would look like if the doom source code were based on PSXDoom instead of Linux Doom, truly an alien and almost alternate history like experience. EDIT #2: Was the shotgun in Doom 64 always this.. weak? If I understand this correctly, then each pellet should do a random amount of damage from 4-16 in steps of 4, so the damage output per attack lies between 28-112, which is 7 less/more than the vanilla min/max, but for some reason I often find myself struggling to kill more than one zombie in one shot or an imp in less than three, even though the average damage should be 56. FireSeraphim wrote: Playing this reverse engineered source ports and it's versions of PSXDoom and DOOM64 is certainty an experience. I played a few minutes of both your versions of PSXDoom and Doom64 and it's like an utterly alien experience. 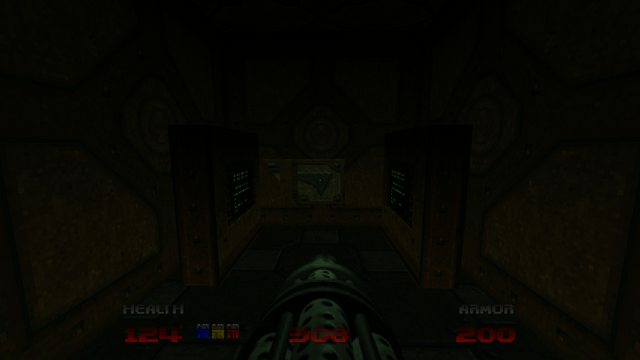 I honestly think this is what an alternate universe version of GZDoom would look like if the doom source code were based on PSXDoom instead of Linux Doom, truly an alien and almost alternate history like experience. yeah, I have to say for a version of Doom that is truncated and you'd think would feel worse to playing the regular version, this between the music and lighting and the subtle differences actually make for a really neat alternative experience. I found using Aubrey Hodge's music with PC Doom didn't quite fit, but it works perfectly in these three games because of their slower, more atmospheric and chunkier feel. Great! I see now! I also set Rendering Quality in Quality and the switches in map 2 look stretched and map 3 looks the same way like your screenshot. It also happens in other maps. Do you always play Doom using Rendering Quality in Quality mode? About the shotgun...that's the GZDoom P Random which causes this, you can also notice Super Shotgun is stronger than usual, killing Hell Knights and Mancubi with two shots. We will see what happens with this bugs and get them fixed for next update. You know these things happens, specially when my brother do all the programing work for two projects, this and PSXDoom Master Edition for Play Station. Thanks for your support!